Data Wiper Software provides solution to wipe entire or selected data from your computer hard disk drive and USB removable media. Disk cleaner software permanently cleans sensitive data (such as financial records, passwords and other confidential documents) for maintaining computer privacy. If you delete data from your computer system by using Shift+Delete key or from emptied recycle bin folder, the data is not permanently deleted and can be recovered by using data recovery software. For completely wiping data, you can use data eraser tool and makes your system performance in better way. Pro Data Doctor Secure Data Wiper permanently wipes data from desktop PC/Laptop using Destructive and Non-Destructive mode. In Destructive mode, software completely wipes saved or unsaved disk data by selecting entire disk or disk sector range to wipe the data. On the other hand, Non Destructive mode, software wipes traces of deleted files, unused disk space, internet files, system files and deleted applications and you can permanently delete selected data according to your choice. Easy to use data wiper software is cost effective and facilitate with systematic help manual for user’s assist. Erases data permanently from computer hard disk and USB flash removable media drives. 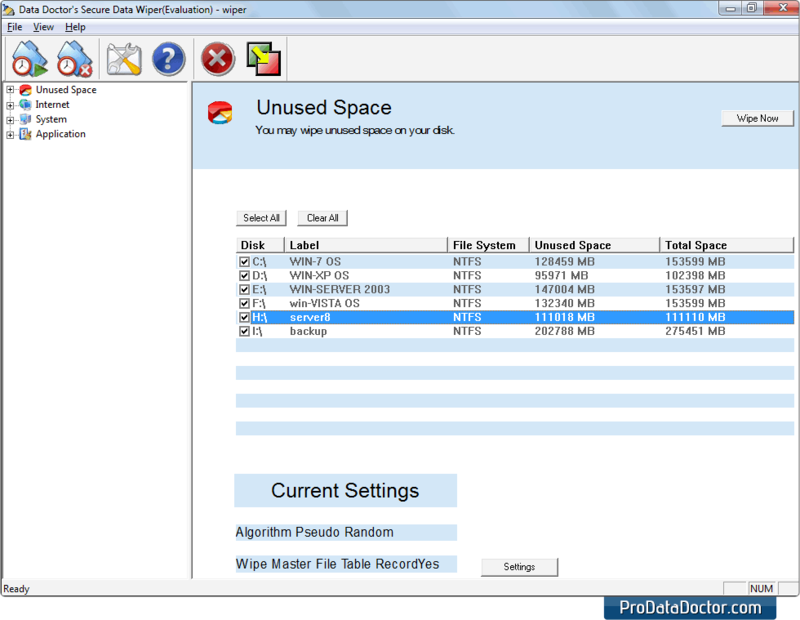 Completely wipes entire or selected disk by using destructive or non-destructive wiping mode. Facilitate to switch from non-destructive wiping mode to destructive wiping mode or vice versa. Permanently wipes deleted mails, chat conversation, passwords and other internet sensitive data. Cleans unused disk space, internet history, cookies, temporary internet files, office documents, visited websites, administrator files and many more. Enables to protect your confidential data which you don’t want to share to anyone.